Follow the story of the wondeful characters from The Hobbit Trilogy from the beginning of the adventure in An Unexpected Journey, to the deadly dragon in Desolation of Smaug, and all the way to the final chapter of the story in Battle of the Five Armies. This adventure is one that will change their lives forever and won’t soon be forgotten. Take home this limited edition of 2500 framed FilmCell presentation that boasts 6 clips of real film from the movies in the Hobbit trilogy. Follow the story of Bilbo Baggins from the beginning of his adventure in An Unexpected Journey, to his daring run in with the deadly dragon in Desolation of Smaug, and all the way to the final chapter of his story in Battle of the Five Armies. This adventure is one that will change his life forever and won’t soon be forgotten. 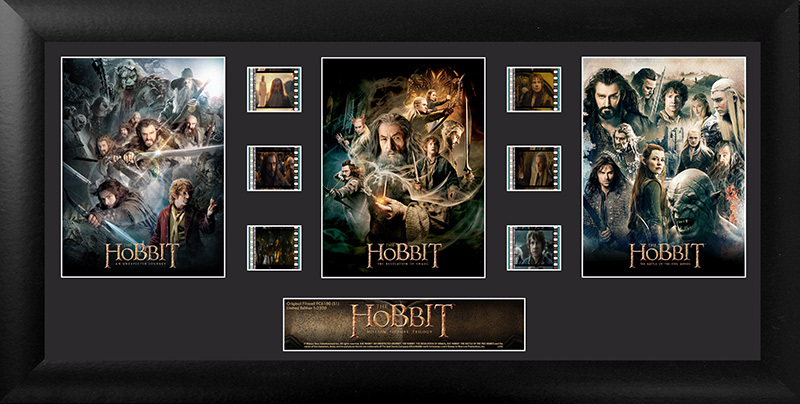 Take home this limited edition of 2500 framed FilmCell presentation that boasts 6 clips of real film from the movies in the Hobbit trilogy.